PORTLAND, Ore. — New U.S. tariffs on steel and aluminum imports could ultimately raise the price of trucks sold in the United States, top executives at the world’s largest commercial vehicle manufacturer warned. The Trump administration’s 25% tax on steel and 10% tax on aluminum imported from Europe, Canada and Mexico went into effect June 1, prompting retaliatory measures by the affected nations and sparking fears of trade wars. 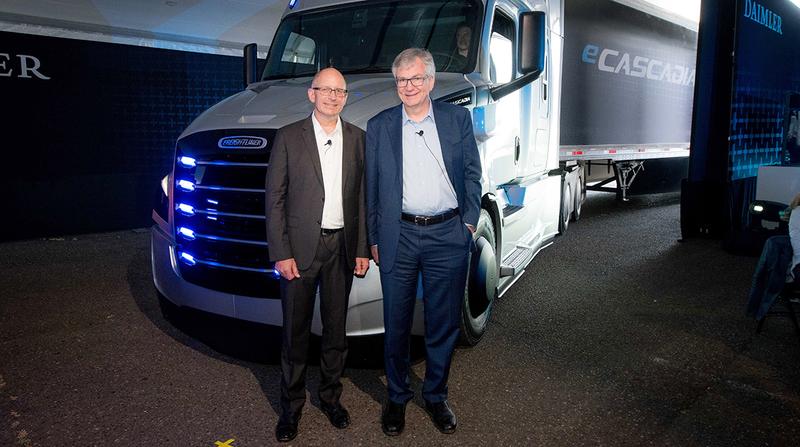 Martin Daum, who leads Daimler’s global truck and bus division, said he always is concerned about such barriers to free trade, not just in the United States but around the world. In the end, it is a “big mistake” for countries to take a more nationalistic approach to trade, he said during a briefing with reporters on June 6 here at Daimler Trucks’ North American headquarters. As a global manufacturer that builds and sells vehicles across the world, Daimler Trucks is committed to all the countries in which it operates, Daum said, adding that companies in many modern industries no longer think in terms of national boundaries. The creation of greater trade barriers and tariffs, however, makes life more cumbersome for manufacturers that exchange goods back and forth across international borders. In the end, though, it’s the customers and the citizens of those countries who really suffer because they pay more than they should, he said. “We’re not ready to speculate on what that value might be,” but those increased costs will be passed along by steel and aluminum companies and work their way through the whole revenue chain, he said. However, that will not necessarily put a damper on the booming U.S. equipment market. DTNA, which builds Freightliner and Western Star trucks and Detroit engines and components, is the largest producer of commercial trucks in North America. Worldwide, Daimler Trucks has sold about 21% more trucks in the first quarter than it did in the same period last year, the company said. In North America, first-quarter sales rose 24% from a year ago. The truck maker also cited record order intake in the first quarter, with orders up 29% worldwide and as much as 93% in the North American market. That order activity is extending the manufacturer’s North American backlogs. Moving forward, however, manufacturers will need to contend with the ramifications of trade disputes. Although the Trump administration’s steel and aluminum tariffs were aimed at protecting American workers, they could raise the cost of products for American businesses and consumers. Daum made the argument that the more tariffs a country implements, the more expensive life in that country becomes.